Years ago, Heritage Christian Center was a fellowship of believers that included a Christian school. The pastor died unexpectedly in June, 2001, but his widow worked hard to keep the doors open. Without a pastor, the ministry dwindled to just a few people. After joining the faculty at Calvary Baptist School in Menomonee Falls, this dear Christian lady began discussing with the pastor the possibility of a revitalized work in Cedarburg. With Calvary Baptist Church of Menomonee Falls as a partnering church, and with Dr. Ed Fuller, state representative for the Wisconsin Association of Regular Baptist Churches as leader, a group of about 15 people began to meet on Sunday mornings in February 2007. By August of that year, the group approached Pastor Mark Brooks about the possibility of being the first pastor of Heritage Baptist Church in Cedarburg. Pastor Brooks was the Associate Pastor of Calvary Baptist Church in Menomonee Falls, just returned from a deployment as an Army chaplain. 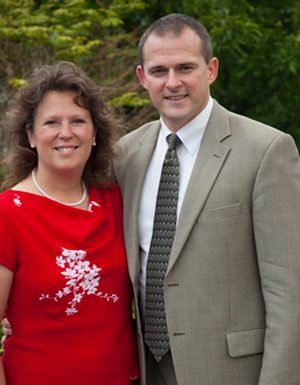 On April 27, 2008, Pastor Brooks agreed to be the pastor of Heritage Baptist and began ministry here on July 1, 2008. By that time, attendance in the fellowship was averaging in the thirties. By God’s grace, a year later, the fellowship had doubled in size. Through the faithful service of many believers here, God has enabled us to expand children’s and youth ministries and the Sunday School program. We look forward to God’s continuing work on our story, and will strive to be a faithful light in our community until Jesus returns!